Is your apple tree dropping fruit? Don’t panic. There are several reasons why apples drop prematurely and they may not necessarily be bad. The first step is to identify why you have premature fruit fall from your tree and then ascertain if it is necessary to provide a remedy. Read on to find out what makes apples fall from the tree. What Makes Apples Fall from the Tree? Let’s start with the simplest and most positive reason why apples may drop prematurely. Sometimes, early fruit drop in apple trees is just Mother Nature’s way of reducing a heavy fruit set. This isn’t necessarily bad at all; in fact, it is recommended that you thin apples to one per cluster, six weeks after full bloom so that each apple is 4-6 inches from the next. Thinning in this manner prevents limb breakage from overly heavy fruit set and allows the tree to produce the largest, healthiest fruit. This natural reduction in crop size is called “June drop” and occurs either as suggested in June or late May and peaks about 8 weeks after flowering in early July. Both apples and pears are prone to June drop. If the weather is cool and wet, June drop can be quite large and last quite a while. Don’t worry though, if just one out of 20 flowers sets fruit, you have a full crop, so losing some isn’t earth shattering. Again, it’s just Mother Nature’s way of reducing competition so there are enough resources to bring the crop to fruition. If the June drop is especially alarming, in the future, try pruning to allow more light into the tree. 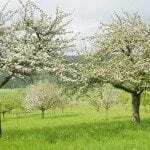 Also, a lack of nitrogen might be at fault, so apply a general fertilizer but be careful not to over feed since too much nitrogen can also result in apple trees dropping fruit. 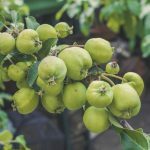 Lack of water can also cause premature fruit fall of apples, so be sure to maintain a watering schedule and mulch to retain moisture and regulate soil temps. Other reasons for fruit fall are a bit more sinister. Attack by either pests or disease can result in fruit drop. For this reason, adherence to a pesticide spray schedule is important. Be sure to follow the manufacturer’s instructions and don’t spray when pollination is taking place since you don’t want to kill off the bees and other pollinators or you really won’t get any apples! Speaking of pollinators, another reason an apple tree might shed fruit is if there is inadequate pollination during bloom time. 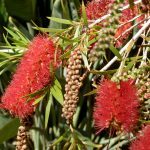 Keep pollinators within 50 feet of the tree, encourage beneficial insects and bees by companion planting other flowering plants nearby, and avoid using pest control sprays when the tree is in bloom.